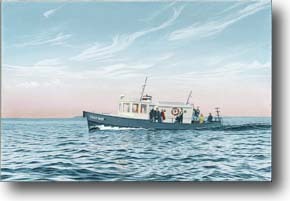 ends a long line of tugs including the "JAC" originally from the Parr family. The fall colours and granite rocks provide a colourful contrast to the stark outlines of the tug. One of Tobermorys local tugs, on vacation in the Benjamins, North Channel. The red granites, trees, and crystal clear water are a draw of immersurable beauty that brings people back year after year. 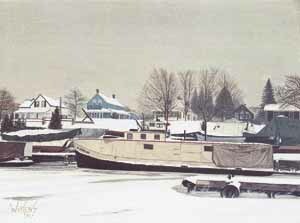 Spring thaw, and the fishing tugs are anxious to get to work. 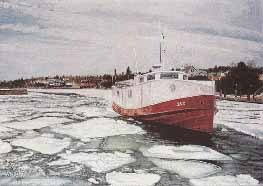 Here the "JAC" is attempting to free her sister ship, the "Michael L", which is still frozen in the ice. 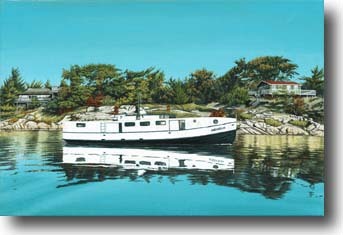 The blue of the sky and the green of the water help define the reds of the tug and give this piece its perspective. 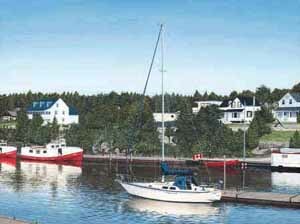 Visual depth is created here with the foreground dock reflecting the toes & shape of the hull on "Dyker Lass". with the lights in the library giving the only hint of life. but the steam tugs are beginning to make their presence felt.